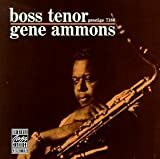 In his essay on tenor saxophonist Gene Ammons in Living with Jazz: A Reader, Dan Morgenstern says, “...The life of this man, who made so many people happy with his music, was scarred by injustice and misfortune. Yet he and his music remained whole to the very end....” Twice given unusually harsh sentences for narcotics possession, Ammons was then arrested for playing in a club, which was a violation of his parole, and sent back to jail for an additional five months. Son of the famous boogie woogie pianist Albert Ammons, music was his birthright. He was born in Chicago on April 14, 1925, and after hearing Lester Young decided on the saxophone. He came through the excellent music program at Du Sable High School and at seventeen joined the big band of Chicago trumpeter King Kolax. 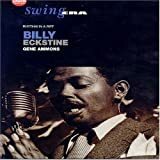 In 1944 Billy Eckstine brought him into his band where he was the principle soloist during his three-year stay, despite the inclusion over that time of star tenors Dexter Gordon, Wardell Gray, Sonny Stitt, and Lucky Thompson. While with Eckstine’s band Ammons recorded the famous tenor battle with Gordon on “Blowin’ the Blues Away.” And it was Eckstine who gave him the nickname “Jug” because of the shape of his head. In 1947 Ammons recorded with his own group and then replaced Stan Getz in Woody Herman’s Second Herd in May 1949. In 1950 he and Stitt fronted a septet that became famous for its leaders’ tenor battles. And their rendition of the ballad “My Foolish Heart” became a hit and was named by Billie Holiday as one of her ten favorite records. “Gene Ammons was a big, gentle bear of a man who played the tenor saxophone with a sound and feeling synonymous with soul,” says Morgenstern. “His musical life spanned four decades, and he had hits in each of them....” However, many critics were inclined to dismiss this style of playing which in the mid-fifties was termed “soul jazz.” “...It was not until the early ‘70s that Gene was given just critical recognition as one of the major tenor voices in jazz,” continues Morgenstern. Ammons was well received in Europe on a tour late in his career, but soon after his return he entered the hospital with bone cancer and died on August 6, 1974.